In anticipation of International Women’s Day (this Sunday), let’s look at how women are faring in Ontario’s labour market. 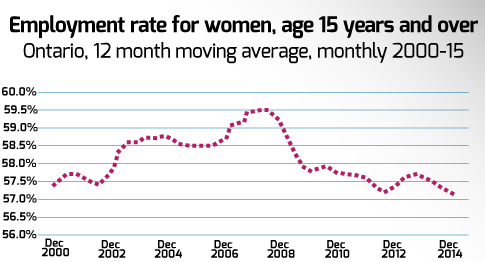 Here’s a shocker: in terms of Ontario’s employment rate, women have made no gains since the year 2000. Women began the century with an employment rate of 57.4 per cent (12 month moving average, December 2000) and they began 2015 with an employment rate of 57.2 per cent – slightly less than the December 2000 number. And in between those years, women have been on a roller coaster ride when it comes to jobs. Take a look at the chart below. It shows how the employment rate for women in Ontario peaked in the fall of 2007 and again in the spring of 2008. But, as one might expect, women’s employment fell sharply during the 2008-09 recession. Today, the employment rate of women sits even lower than the recessionary trough. Breaking this trend down by demographic group, we find the patterns vary greatly by age. Young women aged 15-24 saw their employment rate hold fairly steady between 2000 and 2007. The employment rate for this group began to drop even before the recession hit. Their employment rate continued to fall until the end of 2012, reaching a low of 50.5 per cent. The past 12 months have seen a steep increase in young women’s employment rate as the population of this group has fallen faster than the number of jobs has increased. The story is different for women in their prime working years: as the chart below shows, it’s been a bumpy roller coaster ride since 2000, punctuated by a pretty steep employment drop due to the 2008-09 recession. The employment rate of prime working age women fell by two percentage points between the summer of 2007 and the summer of 2009. After the recession, the employment rate held steady for almost three years, hovering around 76.5% before finally beginning to recover in the fall of 2012. 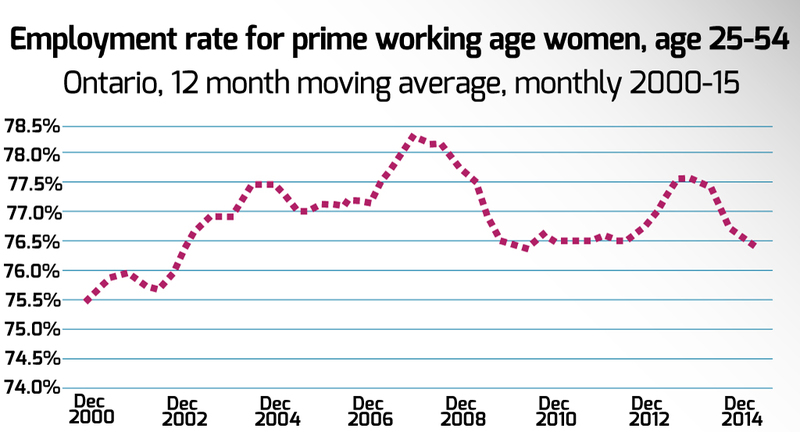 Prime aged working women saw an employment crest in 2013, but over the past eight months, the employment rate has fallen right back to the recessionary trough. The roller coaster ride isn’t over yet. Women aged 55 and over have experienced a very different pattern than their younger counterparts: their employment rate has been on a slow and steady rise, from just under 20 per cent in December 2000 to just over 31 per cent in 2015. A trend that is the result of both population aging and women working longer. 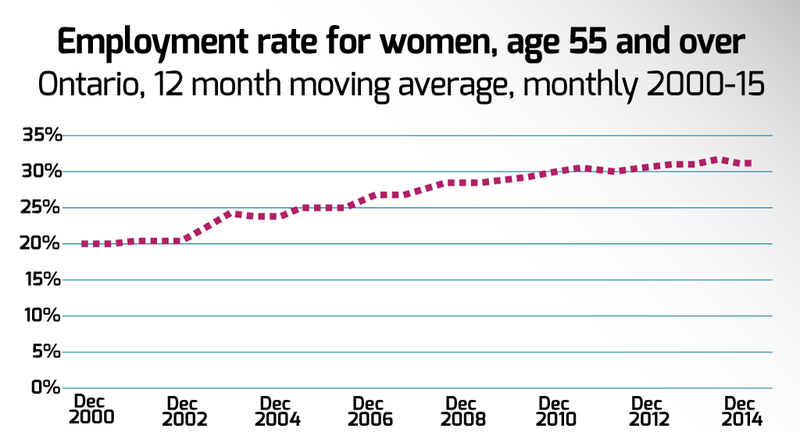 Recessions are brutal, and women in Ontario certainly felt the impact. As time marches forward, young women are encountering fewer employment opportunities while older women are working more. Women in the middle of the age spectrum have been on a roller coaster ride that’s been driven by both cyclical and structural elements.